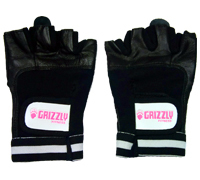 Constructed with premium quality synthetic leather and stretch Spandex for durability. Elastic wrist band and loop & hook closure ensures a secure and comfortable fit. Convenient tab on the back of gloves makes removal fast and easy. Reinforced imapact areas on palm and fingers provide comfort, protection, and enhanced grip. ** For Sizing Suggestions only. Size may vary slightly by material. ** Measure the width of your palm in the centre of your hand.